Have you ever seen it? It’s very silly. I saw it maybe 10 years ago, and to be honest, I don’t remember any specifics. I remember coming out of the theater a bit breathless from the zaniness of it all. I remember feeling the same way after the Complete History of America (abridged). The Reduced Shakespeare Company (RSC) website lists seven minimum opuses! In addition to Shakespeare and American history, they’ve tackled sports, Hollywood, the great books, western civilization and the bible. My, they’ve found quite a little niche here! I’m sure they’re all quite funny. 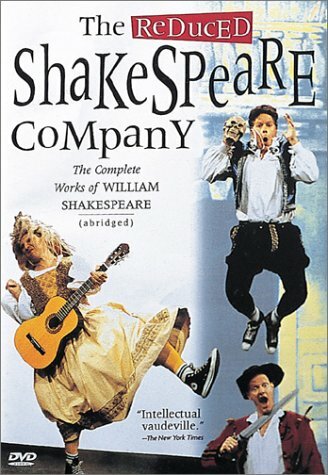 Anyway, I thought it would be fun to revisit when I saw a video of a 2000 stage production of the RSC performing The Complete Works of William Shakespeare (Abridged) is available on Netflix (it’s also on YouTube). 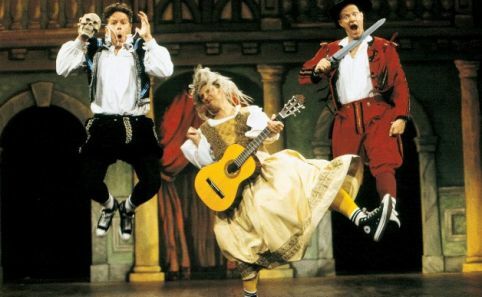 The three actors first introduce themselves to the audience and begin with a parody of Romeo and Juliet. Next, they do a parody of Titus Andronicus, portraying it as a cooking show. Following it is Othello, which is done through a rap song. The rest of the first act demonstrates most of the other plays, with all of the comedies being combined into one convoluted reading (the justification being that they all recycle the same plot devices anyway), all of the histories being acted out through an American football game with the British Crown as the football (or as a soccer match in at least one German production or an Australian Rules football game in the recent Australian production), a reduction of Julius Caesar to his death, followed immediately by a reduction of Antony and Cleopatra, and a reduction of Macbeth to one duel while explaining all the other elements (witches, Macbeth’s downfall, etc.) in poor Scottish accents. There is also a failed attempt at scholarly discussion of the Shakespeare Apocrypha. At the end of the act, the characters are about to finish when they realize that they forgot to perform Hamlet, Shakespeare’s greatest work. Adam (Adam Long) becomes nervous and petulant about this and runs out of the theater with Austin chasing him. 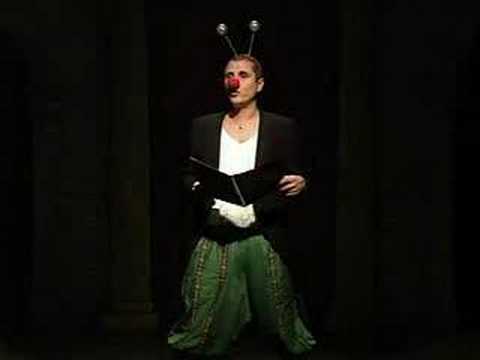 The final actor is left to entertain the audience by himself, which he does by telling jokes and calling for the intermission (the role’s second performer, Reed Martin, who studied clowning before becoming part of the Reduced Shakespeare Company, would play the William Tell Overture on his larynx and eat fire before calling for intermission). After the intermission, the two actors who left return, saving their partner from having to cover the sonnets by writing them down on a 3×5 card and passing it around the audience. The reluctant one is convinced to continue with the performance. The entire second act is the performance of Hamlet. The audience gets involved during this segment when one audience member is asked to portray Ophelia for the Nunnery Scene. The rest of the audience makes up Ophelia’s subconscious, with three sections that each represent her ego, superego, and id. After the portrayal of Hamlet, the actors play it out several times increasing their speed of delivery. They finish by performing it backwards. Oh yes. It’s as silly as it sounds. I don’t really have much to add. The whole thing is silly from beginning to end. Hamlet (half the show) is really funny. The play-within-the-play is presented as a puppet show and a shark with Jaws music makes an appearance. They skip the “To be, or not to be” speech because the audience is laughing and makes the actor self-conscious (he milks it). Ophelia drowns on a cup of water (this is even funnier when done in reverse in the finale). It’s a giggle-fest. It’s very kid-friendly, too. My preschooler was loving it. He was especially fond of the guy that often needed to vomit on audience members (always a crowd-pleaser with the little ones). He also liked the accordion playing, the fire eating (and marshmallow roast) and the William Tell Overture tapped on the larynx. That, my friends, is a very special skill. Each year, the small theater troupe Taffety Punk gives a group of actors a challenge: Memorize your lines and then turn up the morning of the performance for a single day of rehearsal in which to learn the requisite blocking and stage direction. The result is what the company calls Bootleg Shakespeare. See what happens when 30 actors take a stab at staging Shakespeare’s “The Two Noble Kinsmen” — in the punk-rock style for which Taffety is known, no less on Monday at 7 p.m. Folger Theatre, 201 East Capitol St. SE (Metro: Capitol South). 202-261-6612. I’d love to see a performance of The Two Noble Kinsmen – I’ve never seen one before, and AFAIK there isn’t any available on DVD or video.